The mission of the Instructional Technology Program is to prepare professionals to improve their learning and performance applying a systemic and systematic instructional design process with the effective use of technology. The program values life-long, independent, and collaborative learning that fosters leadership for change. The Instructional Technology (ETEC) program at CSUSB prepares students to improve their creation and use of instructional media in their teaching practice or to take their place in any number of careers. The Instructional Technology program offers one master’s degree (Master of Arts in Education) and two certificates (Educational Technology, e-Learning). Students will have the choice of face-to-face, hybrid, or fully online courses, allowing each person to choose a course delivery format that best fits their situation. "If you are looking for a good program that gives you a lot of individual attention for a great price, CSUSB IT program is definitely, is definitely a good choice!" For more Testimonial videos from the IT Alumni, go to the IT Community Page. 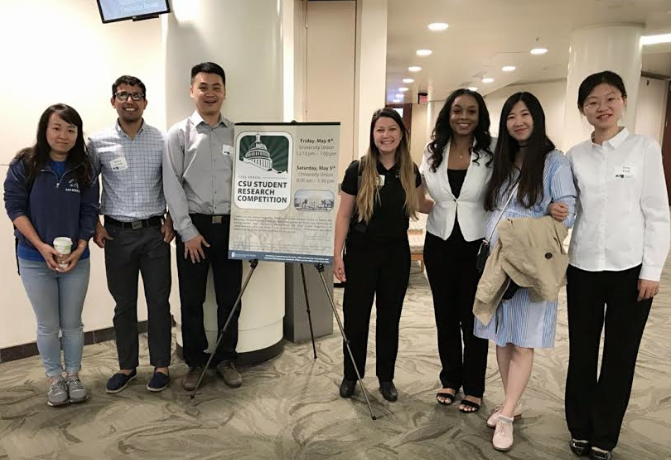 Eyda-Qi Guo, Tong Feng, and Lu Jia have represented CSUSB at the 32nd Annual CSU Student Research Competition at Sacramento State University on May 4th and 5th, 2018. For more Student Achievement news, go to the IT Community Page.